Was anyone else as happy as I was to get to the end of 2016? It just felt like it needed to be over. It felt so good to get into 2017. Part of that good feeling was knowing The Pet Blogger Challenge was going to happen giving me a chance to look back on my blogging year. Next month will be my 10th year blogging. Where did the time go? I started Pet Product Review in February 2007. Last year Pet Product Review morphed into Pet Faves, and I switched my focus from being a review blog to working on being a resource for pet parents looking to find pet products for their pet and for their lifestyle. 2.What was your proudest blogging moment of 2016? I’m thinking…I’m thinking…Oh… Starting the Pet Blogger Linky Party to give bloggers a place to show off their pet posts and possibly be featured on one of the host blogs. I cohost with Heart Like A Dog, Felines Opines, and Momma Kat and Her Bear Cat. It happens the 1st and 3rd weekend of each month. In fact, it’s happening now. 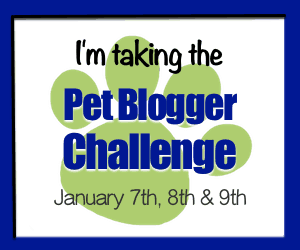 So come join the party and share your Pet Blogger Challenge post. Small pets tend to get the short end of the stick when it comes to what products are available for them. I was seeing new subscription boxes popping up all the time for dogs and cats and I wondered if there were any for other pets. I was happily surprised to find quite a few and shared them in Your Other Pets Don’t Have To Miss Out On Subscription Boxes. This was also my most popular post for 2016. I hope small pet parents find it helpful! 4.Year after year, one goal that we all seem to share is that we want to reach more people. What one tool did you use or action did you take this year that had the most impact on increasing traffic to your blog? I think I’m getting better at making sure my posts are search engine optimized with the help of the Yoast plugin. Search engines are by far my biggest source of traffic and this is something I want to continue to work on. 5.Which of your blog posts got the most traffic this year? (Please include a link.) Have you noticed any themes across your most popular posts? Your Other Pets Don’t Have To Miss Out On Subscription Boxes was my most viewed post in 2016. My most popular posts cover a variety of post types from products that help solve a problem to reviews to product information posts so I don’t really see a theme. I’m going to take this as a good thing because I can write different type of posts to meet different readers needs. I have over 200 blog feeds in my feed reader so there is no way I could pick one. Plus I hate choosing just one because they all have something I enjoy. Some of them I follow to learn from, some I follow to be entertained or to keep up on a topic or to get ideas for my own blog. They’re all my favorite and inspire me in some way. 7.What is one thing your readers don’t know about you or your pets that would surprise them? I’m torn between my life is so boring I have nothing that would be surprising and I’m an introvert and we don’t just share information willy nilly. I think I’ll go with the first. 8.What is something you’ve learned this year that could help other bloggers? This- Watch it when you have a free hour. It’s worth it. 9.What would you like to accomplish on your blog in 2017? Blog more consistently. My goal is to post twice a week and I expect you to hold me to it! 10.Now it’s your turn! You have the attention of the pet blogging community – is there a question you’d like answered, or an aspect of your blog that you’d like input on? Thanks so much for joining the Challenge, Dawn! It sounds like you’ve really dialed in what you want to do with the blog, and I’m sure that 2017 is going to be fanatic. I’ve taking a more active approach to Instagram in the past few months, and being consistent seems to be more important than the quality of the photos. Just snapping a shot with my phone in our normal course of life and sharing it seems to get as much interaction as posed photos with landscapes in the background. Don’t get too hung up on setting up a shot – people like authenticity. I’m sure it will be great! Thank you, Amy! I do need to get more consistent. I think a big problem is my house tends to be chaos and I don’t feel comfortable taking pictures with my old carpet and furniture. So much to work on! Wow, 10 years! What an inspiration. I love that you found those other subscription boxes for pets other than cats and dogs. I need to remember your weekend pet blogger hop. Sometimes I get lazy when the weekend rolls around. I guess that should be one of the things I work on this year. Bookmarked the “30 Days of Genius” to watch soon and I hope you have an amazing 2017! Thank you, Elaine! And please do come join the Linky Party. You don’t even have to put the linky on your site. Just drop your blog post link in on one of the cohost’s sites. Brene Brown is a favorite of mine so I hope you enjoy the video. Happy New Year! Thanks for sharing more about your blog. With Instagram, I treat it as a fun treat. I’m constantly taking pictures of my dogs or their meals and share them when I get a moment. I don’t try and gain traffic from it. It’s the one place where I can just be a dog lover and not a blogger. I do gain followers from there, which I appreciate, but I’m trying to keep it fun. This is working well for me. I’ve signed up for our Instagram account … but that’s it … so I can’t be of much help there. I love Brene Brown … she really knows how to verbalize things that many of us struggle for years to put into words. Not to mention finding the perfect way to share her insights with us so that they truly “click” and don’t become just more, “I know that logically, but not emotionally.” I’m glad you started the Linky Party. I’ve found many new friends I wouldn’t have had before.